Professional air brush design is an art that requires an industrial grade compressor. Depending on the size of the project, compressor type makes a substantial difference in performance and outcome. For top quality air brush results, Silentaire Sil-Air – 200 – 100 product line of air compressors are the recommended choice of expert designers. Equipped with heavy-duty 1/2 horsepower engine pumps, Silentaire Sil-Air compressors offer 84 – 114 PSI Op-Pressure supported valves for easy control over results. 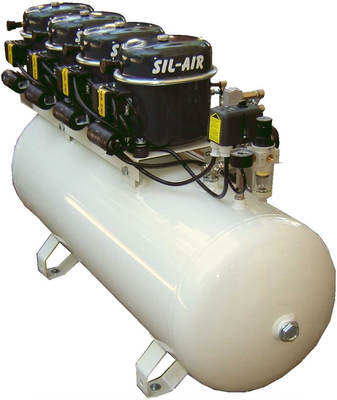 Sil-Air 200 – 100 compressors are great for easy application of paint to large scale projects. Silentaire Sil-Air 200-100 line of compressors are engineered for "noiseless" output.Units includes a large tank with tank and line pressure gauges, built moisture reducer, safe valves, air filters, and comfortable carry handle and wheels. Offered in 220volt/60Hz and 220volt/50Hz voltage unit models.